My family likes to joke that we’ve all grown Mickey ears as we’ve recently become huge fans of all things Disney. The fire was ignited a couple of years ago during a Disney Cruise and then in June with my husband’s first trip ever to Disneyland. When I was invited to cover the opening of Walt Disney World’s New Fantasyland in Orlando, we knew we had to spring for the whole family. Here are eight reasons your family will fall in love with the new Fantasyland just as much as mine did! Find Orlando deals, including discount Disney World tickets at Get Away Today. Scroll down for how to save! As Disney World first-timers, everything was new to us but even in our virgin state, we were blown away by New Fantasyland’s multi-year, multi-million-dollar expansion—the largest in the Magic Kingdom’s 41-year history. 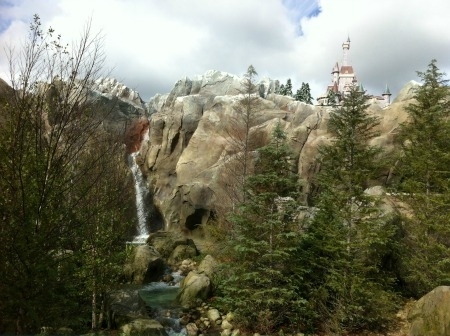 New Fantasyland is comprised of the Enchanted Forest and Storybook Circus areas. Pictures speak a thousand words and this insider glimpse is worth volumes. 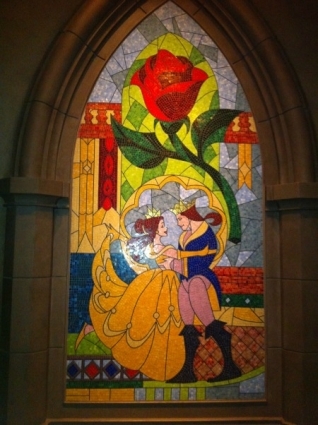 The Disney classic, Beauty and the Beast, is the star of New Fantasyland and the Beast’s Castle is the highlight with stunning attention to detail inside and out. 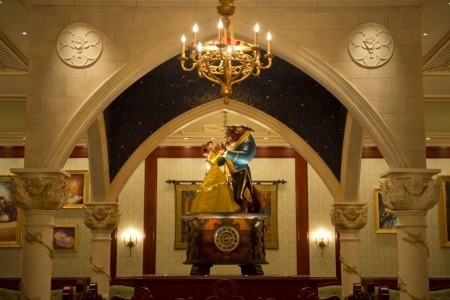 Inside the Beast’s Castle, the new restaurant Be Our Guest offers French-inspired quick-service dining by day and fine dining by night. Be prepared: Dinner is booking out six months in advance so lunch is your best bet. From chandeliers, gargoyles, and mosaics to the Armor Hallway where six suits can be heard occasionally whispering to the 20-foot ceiling that is painted with fluffy clouds, to the snow lightly falling in the French countryside—the Beast’s Castle is an enchanting replica of the movie. Inside Maurice’s cottage, guests are magically transported to the Beast’s library through an Enchanted Mirror. Several children are then invited to step into the story with props and costumes as everyone falls in love with this story “as old as time.” Prediction: This will be the most popular attraction in New Fantasyland. Of course, egocentric Gaston has a large presence in Belle’s Village so be sure to check out his tavern (after you’ve marveled at his conspicuous bronze statue out front, of course). His sidekick LeFou has his own “brew”—a frozen apple juice concoction with a hint of toasted marshmallow, topped with passion-fruit-mango foam. 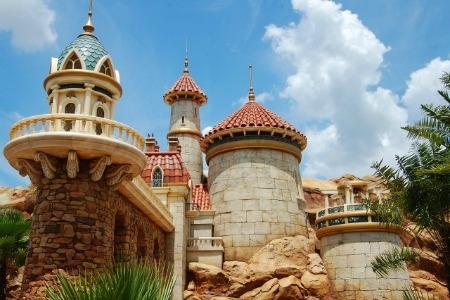 In addition to the Beast’s Castle, New Fantasyland adds a third fortress: Prince Eric’s Castle from The Little Mermaid. Fans of this Disney classic will love this musical journey as they begin at the shoreline of Prince Eric’s Castle and plunge below the ocean’s surface in clam shall cars to view an iridescent sea world come to life. This throwback to circuses of yesteryear features fun under the Big Top with Dumbo, the Flying Elephant, a ride that has doubled in size. It also features a very welcomed indoor air-conditioned, interactive waiting area to keep the kids entertained until your pager goes off. And the best news of all is New Fantasyland is still growing and Seven Dwarfs Mine Train is coming in 2014. This descent into a glistening diamond mine will feature a first-of-its kind ride system with a train of vehicles that swing back and forth as they respond to the twists and turns of the track. Heigh-Ho, indeed! Want to save money on your Walt Disney World vacation? Of course you do! Get discounted Disney World tickets and packages when you book through Get Away Today. Make sure to let them know that Travel Mamas sent you! 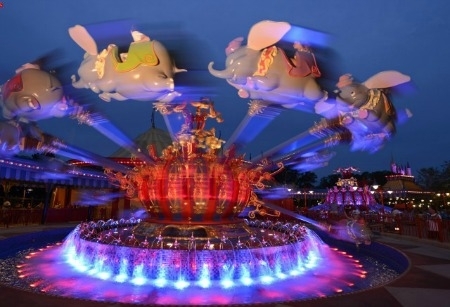 Which new Fantasyland attraction would your family like most? Let us know in the comments! 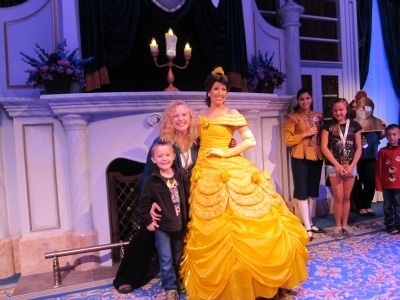 A Note from The Outdoorsy Travel Mama: A portion of my family’s Disney World trip was provided by Disney. All opinions are mine, as always. What an exciting surprise for your kids! I think Beauty and the Beast and Little Mermaid have always been the favourite movies of my daughters so we would love to see pretty much everything in the new Fantasyland. 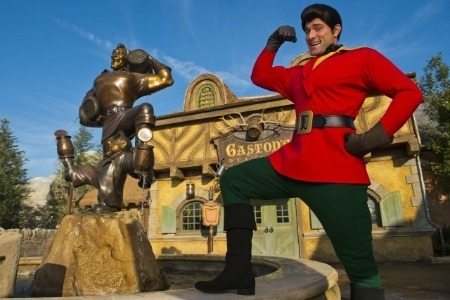 Personally, I would love to meet Gaston – he’s such a fun over-the-top character! I had no idea that this expansion was underway. 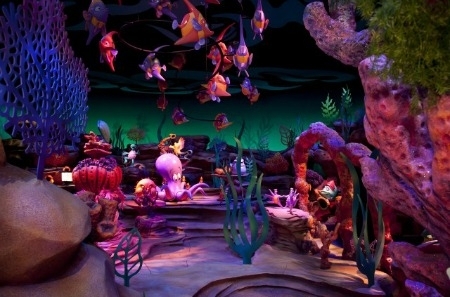 I think its neat that Disney movies provide new ideas for rides. More to explore! Ellen – Yes, I love how Disney keeps expanding and making it a new adventure every time you visit the parks! I’d highly recommend watching Beauty & the Beast and the Little Mermaid before going. Totally made it come to life! I had no idea! How awesome, thank you! I think we will have to start saving tpfor this one! We’re going in November and I cannot wait!!! Sara-Jayne – So exciting! I’m sure you’ll have a wonderful time exploring the New Fantasyland!